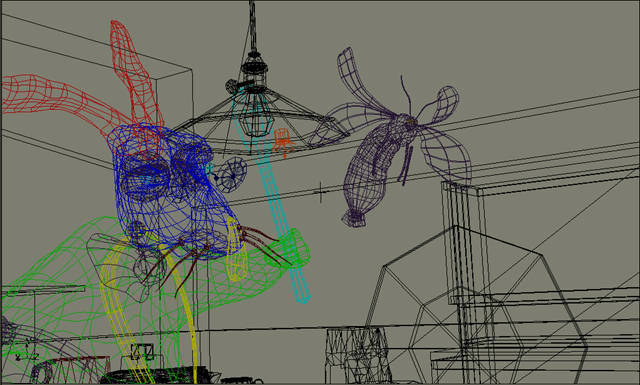 1999 wireframe for the Blue Sky “Bunny”. “Nearly all the animation” in Bunny was done in SOFTIMAGE|3D. While its moving story line has certainly contributed to the popularity of “Bunny,” in CG circles what makes this piece so special is the fact that it is the first computer-animated film whose environments were rendered entirely using radiosity. Radiosity is an advanced rendering technique that mimics the subtlest properties of natural light. For “Bunny,” the use of radiosity created an unparalleled dimensionality and organic realism never before attempted in a computer-animated film. Helping the Blue Sky team accomplish this feat was CGI Studio, the company’s proprietary lighting software. Bunny’s fur was quite complex. There were more than 14,000 clumps of hair on Bunny’s body. Each clump consisting of approximately 50 hairs—were actually invisible cones that were texture-mapped with a mixture of short and long hairs. In total, there were 5640 long-hair cones, 8524 short-hair cones, and 269 shaggy-hair cones. Adobe Photoshop and Interactive Effects’ Amazon 3D Paint were used for texture-map creation. Work on the models in “Bunny” began long before the NURBS modeling method was developed…nearly all of the models were built using an old modeling method called Constructive Solid Geometry (CSG). Nearly all of the animation was done in Softimage. To make the CSG models animate in Softimage, Blue Sky wrote a program that converted the CSG models into polygonal representations that Softimage could understand. Because Amazon 3D Paint works with polygonal models, the team had to texture the CSG models using a combination of Photoshop and proprietary tools. All modeling and animation were done on Silicon Graphics workstations. This entry was posted in Friday Flashback and tagged Blue Sky, Softimage by xsisupport. Bookmark the permalink. I had Doug Dooley as a teacher at Animation Mentor (worked for Pixar at the time), nice fellow.